The Angeln Saddleback is a large, lop-eared, black pig with a white band around its body which continues down to its forefeet. They typically weigh 350 kg weight, 92 cm height (boars) and 300 kg weight, 84 cm height (sows). The Angeln Saddleback pig, also known as the Angler Sattelschwein, is a rare breed of domestic pig came from Angeln, a region of northern Germany. 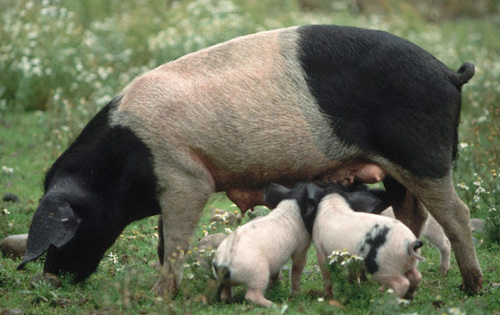 In 1937 a black-and-white landrace was crossed with a Wessex-Saddleback and was soon accepted as a new race. In the 1950's the Angler Sattelschwein was very popular, but a few years later it was considered too fat. Consumers stopped eating them, ranchers stop breeding then and now the breed is nearly extinct.